This site's aim is to present a vivid image of Russian heraldry, and to provide the English-reading audience with reliable basic information on the armorial heritage and the current heraldic practice in Russia. So far a number of our sections is under construction, but we hope that the site may be already interesting and informative. Welcome to the Heraldic Russia! » Russia and the S.M.O.M. Each local heraldic tradition contains a lot of devices and badges marginal to heraldry and to heraldic art, its norms and customs. Indeed, the heraldic tradition in some countries has or has had such a marginal character and sometimes it is very difficult to define how applicable the heraldic criteria of understanding and research are to such tradition. This also applies to some periods of the heraldic history of Russia. We can liken Russian heraldry to a labourer arriving late at the vineyard (Matthew 20:1-15). The "heraldisation" of the Muscovite State began in the 17th century, especially the second half of it. At that time there already existed in Russia a preheraldic tradition of emblems which sometimes were similar to (and even imitative of) Western coats of arms but essentially such emblems represented the domestic traditions, being far from heraldic art. Nevertheless, this difference of genres was not clearly understood either by Western observers or by Russians. As a result, the tendency to neglect the specific features of heraldry became usual even for some heraldists. No wonder that passages on "ancient" Russian heraldry, as well as the preheraldic understanding of coats of arms, often appeared (and appear now) in historical works. It is especially typical of historians who analyze Russian heraldry first and foremost as being a part of the national history - from V. Tatishchev (1686-1750) and A. Lakier (1824-1870) to our contemporaries N. Soboleva and E. Kamentseva. On the other hand, G. Vilinbakhov refuses to appreciate this and tries not to use the term "heraldry" in its narrow armorial sense. This approach would be sufficient only if Russian coats of arms were of no heraldic interest(1). All the problems, present and past, of Russian heraldic thought and practice can be illustrated by the history of the Russian eagle - not because it is the first to come to mind but because its history clearly reflects the development of Russian heraldry. Some writers, especially N. Likhachev(2) and G. Alef(3), maintain that the Byzantine eagle was adopted by the Grand Duke Ivan (John) III first of all not as a sign of Byzantine heritage but as an antithetical analogy to the heraldic eagle of the Holy Roman Empire, under the strong influence of armorial practice. It determined the life and changes of the Russian eagle Some different versions were in parallel use, each imitating Western forms. Some of these disappeared as being too dissimilar to armorial models, for example the version with closed beaks. From its adoption the eagle usually appeared on the reverse of state seals, the obverse being adorned with a horseman killing a symbolical wyvern or dragon. This horseman represented the Sovereign himself(4). Ivan the Terrible (John IV) was the first to introduce a new kind of state seal(5) with a composition combining both sides. The image of the Tsar was placed on the eagle's bosom as an escutcheon of pretence but it remained a stylized portrait There was a strong influence of heraldry but without a deep appreciation of heraldic principles. Seal of Ivan III (1497). On the Great State Seal of Ivan the Terrible the eagle was surrounded by emblems, mostly beasts, symbolizing the provinces of the Muscovite State, with an artificial inclusion of some poorly reproduced coats of arms indicating the Western territorial pretentions of Russia. A perfect Swedo-Polish analogy to this emblematic miscellany is represented in the lecture of Dr. A. Heymowski (herein). Such an emblematic exchange was founded first and foremost on sphragistical practice (so coats of arms until the 18th century were often defined in Russia as "seals"). The specimens of one genre were understood in a context formed by another genre. The Great State Seal of 1667 (reproduced from the matrix). Making a design for the Great State Seal in 1667 the Muscovite artist G. Blagushin also tried to imitate the splendour of the seals of Western emperors, this time surrounding the eagle not with territorial emblems but with small landscape compositions, groups of warriors and ornamentation(6). The official description of this seal is interesting, being included in the state act issued in the same 1667. The eagle is already called a coat of arms but the colours were not fixed and interpretation is doubtfully heraldic. For example, the three crowns explained as being a symbol of the three Tartar realms conquered by Russia(7). It is strange that N. Soboleva considers this text to be absolutely heraldic, a blason(8). A simplified analogy for this composition is on the state seal of Tsar Alexey (Alexis) for the Ukraine(9). The Great State Seal of Tsar Alexey for the Ukraine. The representation of the horseman was not uniform. There were two main versions: one with a spear and a monster (sometimes a dragon and sometimes a wyvern) and another with a sword and without a symbolic enemy. This latter form was especially close to the horseman of Lithuania. On a small personal seal of Tsar Feodor (Theodore) III who reigned from 1676 to 1682 the Russian eagle for the first time assumed a completely heraldic form. It was represented on an escutcheon, the third crown being on a tournament helmet and a mantling was also added(10). It was Feodor who abolished the old complicated system of honours and privileges called mestnichestvo: "the place system". According to this quite "oriental" system the idea of being noble was connected with the holding of hereditary office and not with ancient origin. There was no place for heraldry in that system and probably its abolition was the reason for family coats of arms becoming fashionable in Russia as an expression of genealogical pride. From the reign ot Feodor the use of coats of arms became normal, his own seal being an example. But still no specific colours were established for the eagle. On banners and on illuminated charters it was usually depicted in gold or in natural colours on a white background but there was also a number of other versions in use with different backgrounds and including white, black and even green eagles. All these norms were valid at the beginning of Peter the Great's reign; he also established and used until 1700 a personal flag with a golden eagle on the Russian white-blue-red flag(11). We can note in reference to the eagle of the 16th and 17th centuries that it was an unheraldic emblem, rapidly developing under the influence of the Western heraldic analogies but still without real heraldisation. There is one more fact to be noted. From the late 17th century the intricate symbolic compositions, the so-called conclusions, imported by Ukrainian clergy, were fashionable in Moscow. No wonder that the role of the eagle in conclusions was of great importance. The illustration in Truby..., a homiletic book by L. Baranowicz, published in 1674, is an early Russian example of the genre(12). Here the eagle is represented three times. In the middle of the page it has its usual appearance, only the customary regalia being replaced by a sword with three laurel wreathes and a sceptre with three eyes. The symbols of the four evangelists are next to him, namely a winged lion and ox and then a simplified form of the double-headed eagle for St. John and the Tsar on horseback killing a dragon for St. Matthew. Lastly, in the lower part of the picture the tsarist eagle acts as a background for the Dove of the Holy Spirit. Our Lady blesses the eagle, Her crown being also the middle crown of the eagle. All the details are annotated with phrases from Holy Scripture. The eagle often appeared in conclusions as a background or a frame for the most esteemed images, both secular (a tsar, two symbolic hearts of co-reigning monarchs etc.) and spiritual (a Crucifixion, an icon). The richness and freedom of the imagery of the Russian Baroque also influenced heraldry itself. We can compare the picture from Baranowicz's book with the coat of arms granted by Peter the Great to Count Zotov. The heart Gules transfixed by two arrows Argent saltirewise from the original Zotov coat of arms is adorned here with eagle's head, wings, claws and tail Or and charged with a "stone" with seven eyes and a fess wavy. Other attributes are also added(13). Essentially it is an heraldic conclusion. Both the difference in the genres and the similarity are clear. Like Ivan III before, Peter the Great wanted to use all this emblematic heritage for the demonstration of his parity with the Holy Roman Emperor. The eagle could be used for this purpose effectively only by being made more heraldic and this was clear to such a westerniser as Peter. As a result of one of the early experiments with a public and official use of the eagle as arms, in 1699 appeared a coin bearing an escutcheon charged with the eagle with three crowns. The escutcheon is surrounded by the collar of the newly founded Order of St Andrew and surmounted by a fantastic tiara with a fur lining and three coronets composed of fleurs-de-lis and various leaves(14). It was quite a witty but unique heraldic version of traditional tsarist crowns and caps. Another form, an imitation of some Western heraldic crowns, was frequently used at the time. 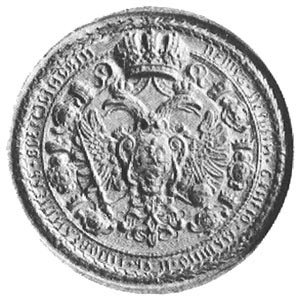 The Small State Seal of Peter the Great (1710s) with the eagle surrounded by shields. In the early 18th century a collection of state seals of different sizes but of identical design was made for Peter. Here the representation is more westernised. The crowns are nearer to the continental royal ones and the third crown is absent from the shield(15). The placing of escutcheons on the eagle's wings seems to be inspired by some German and Polish examples. Soon the main royal crown and then lesser crowns were replaced by imperial ones, this latter version being common long before the adoption of the imperial title in 1721. In rendering the state eagle more heraldic Peter had to define the tinctures. This matter was settled by him in contradiction to proto-heraldic tradition and the German imperial tinctures, Sable and Or, were introduced(16). Lakier supposed that it happened only after Peter's death mentioning some later acts(17) but in fact this reform was carried out much earlier and it is notable that the sources which brought about this change-over were still not fully heraldic. Around 1700 or 1701 Peter abolished the tsarist personal flags with eagles in natural colours. The new personal tsarist flag for the Navy was yellow with a black state eagle holding in its beaks and dexter claw, instead of a sceptre, three realistically depicted maps of three actual seas. Later a part of the Baltic region was conquered and the orb was also replaced by a map(18). The inescutcheon with the horseman representing the monarch was preserved but was strangely interpreted. From the time of Ivan III both the horseman and the eagle were symbols of the Russian or Muscovite state Peter abolished the term "The Muscovite State" so the toponyms "Moscow" and "Russia" were separated. The eagle was understood as a symbol of Russia and the tsar horseman as one of Moscow. And, moreover, the horseman was proclaimed to be St. George(19). This type of interpretation of the state's emblem was absolutely alien to the Russian tradition but usual amongst foreigners. Peter even laid down that the horseman with sword was St. George without the dragon and supported all these new interpretations by making an historical note on the matter, full of mistakes and fabrications(20). There were also various methods, more or less heraldic, of placing the badge and collar of the St. Andrew order in the state coat of arms. The first Russian heraldic officer, Count Santi, made a blazon for the state eagle. In the contemporary, terminologically curious Russian translation the black tincture was called a sandy colour and so on. At the end of the blazon Santi noted that "this coat of arms is not such as it has to be". This blazon remained unauthorised(21). There was no state act establishing a state coat of arms until 1726 when the Senate passed an act for the new seal of Catherine I, the reigning widow of Peter. The description of the arms for this seal determined some main elements and three main tinctures, namely Sable for the eagle, Or for the field and Gules for the inescutcheon(22). The seal was made without any graphical indication of colours, so their determination in the Senate's act means establishing a coat of arms by means of the establishing of an heraldic seal. This practice, continuing the pre-heraldic tradition of sphragislical perception of coats of arms, was used even later. The first state act properly heraldic, the so-called Muennich's Armorial, was confirmed by the sovereign only in 1730. The eagle is depicted and emblazoned thus: Or, a double-headed eagle Sable, armed, legged, beaked and crowned with three Imperial crowns and holding in its claws the regalia, all of the first, the central crown infulated Azur; over all on an escutcheon Gules, St. George proper vested Or on a horse Argent killing a dragon Sable. The whole achievement is ensigned with an Imperial crown(23). The third crown of the eagle is a charge here, probably because of the oval form of the shield. From Peter the Great and till the time of Paul I the state seals of the Russian Empire bore a representation of the eagle between six escutcheons, this design being first used by Peter the Great and heraldically developing the form of the seal of Tsar Alexey. But the eagle itself was still without a large shield, so the third crown was included in the composition. The fineline between heraldry and sphragistical design was not clear and this position of the third crown was understood as normal for the eagle, both in a shield and without it. In the same way the sphragistical composition with provincial arms surrounding the eagle was understood (and later used) as the first full achievement of the Empire. In 1781 a new project for a "coat of arms for the City of Moscow" was prepared by the Heroldmeister Volkov, an active dilettante: the colours were changed here. New tinctures were also introduced to the Muscovite Grand-ducal arms on the eagle's breast. It shows not only that Russian territorial coats of arms were connected with toponyms more than with juridical bodies but also that the influence of the prehcraldic perception of emblems colours was still strong. So the Lithuanian heraldic horseman, being in fact of the same origin, for a long time could not (and cannot even now) choose exact tinctures for himself. The same Volkov was ordered to add provincial arms, or a part of them, to the newly composed coats of arms of smaller towns. The inclusion of a part usually involved a dimidiation (per fess or by another division). But for Volkov this method seemed too boring so for the towns of Kostroma province he used not the coat of arms of Kostroma - Azure, a Lymphad Or on a waves Proper - but Azure, a Lymphad Or as seen from the rear on waves Proper. Volkov called it "a part of a coat of arms"(24). He understood his task but in a proto-heraldic manner. Catherine II granted a lot of coats of arms to cities. Some ol these were good heraldry and even masterpieces, especially designed by von Enden or composed earlier by Count Santi and Count Munnich and then re-granted by Catherine. But usually in coats of arms designed for small insignificant towns there was simply a beast or an object such as the bar of soap of Shuya city. Beasts, usually Proper, depicted realistically, were essentially new versions of old animal emblems. The interest in nature and geography, so typical of the time, only supported this tendency. But the arms landscapes are especially notable. They were coats of arms in name only and through the use of an escutcheon with a provincial emblem as a frame. All this would be no more than bad heraldry if it were not a result of the influence of other emblematic systems, perhaps more popular than heraldry itself. In 1799 Pavel (Paul) I was proclaimed the Grand Master ol the Order of St. John of Jerusalem, so he replaced the badges of St. Andrew by a Maltese cross ensigned with a Grand Master's crown(25). The old form of the seal with the collar of St. Andrew and with escutcheons surrounding the eagle was abolished but not forgotten. The same composition developed into a project for a Grand Coat of Arms of Russia prepared under the supervision of Paul himself(26). This time a great number of provincial arms was to be used. Compiling this achievement one had to choose between two main models, the "Austrian" one with all quarterings in an escutcheon placed on the eagle's breast, and the "Prussian" one. The latter was preferred, not only as a more trivial one or because Paul sympathised with Prussia but especially because this version would preserve the composition with the eagle surrounded by shields. The central escutcheon with the state eagle was surrounded by eight escutcheons (dynasty of Holstein-Gottorp, three grand duchies and four tsardoms) posed in orb and the big shield contained the quarterings reflecting the rest of the Imperial title. At the time a number of principalities had more than one version of their own arms. No wonder that in the new achievement absolutely new versions sometimes appeared. However, not only the old composition but also old forms of crowns were preserved and even supplemented in the same style. The integration of the Russian tradition into the European heraldic context was made quite successfully but not without some mistakes and barbarisms. Probably that is why Paul confirmed the manifesto about this achievement and its parts but neither published nor used it. In 1801 Paul was murdered and all the versions of the state arms established by him were replaced by the older form of the eagle(27). There is a popular belief that the system of heraldry and the heraldic norms were artifically introduced in Russia and that Russian emblems were then arranged according to that system. But as we can see there was too little of a system in Russian heraldry at the time; it was composed of singular achievements and heraldic acts, sometimes contradicting one another. This applies to state heraldry as well as to all public and family coats of arms. The arms of the Counts Sheremetev are a good example. They appeared as a deformation of a Polish prototype and were used in several inconsistent versions incorporating the elements of different emblematic systems and traditions. Finally, an attempt at heraldic correction, made on matriculation in the late 18th century, only made the irregularity greater(28). The same happened with the state eagle. Its further history is marked by two heraldic crises? two recurrences of the pre-heraldic practice. In the second decade of the 19th century, as a parallel to the state arms and more and more often instead of the state arms an unheraldic eagle was used. Its form was influenced both by the Napoleonic eagle and by the unheraldic form of the eagle of Prussia. The details of this emblem were not constant, the number of crowns and the objects in the claws being changed often. This Hoheitszeichen, even officially, was sometimes called the state arms and in any case it was considered the state eagle just as the heraldic form was. In coats of arms, both public and personal, this eagle appeared sporadically as an emblem of patronage, possession or as an honourable augmentation. Some authors tried to ignore the unheraldic character of that stage of the eagle's development(29). Nevertheless, its history directly continues the late preheraldic tradition showing an emblem used like a coat of arms, designed in a fashionable style, this time not heraldic, and imitating western models, this time also not completely heraldic. An example of the eagle's use: the arms of the city of Mozdok, granted in 1842; in the upper part of shield the "unright" form of the State Eagle on a mountain is reproduced from the arms of the Caucasian province, granted in 1828. In the 1830s Nikolay (Nicholas) I abolished the wide use of the unheraldic forms that remained only as a part of some badges and emblems. Under this monarch the six escutcheons of the main tsardoms and principalities appeared on the eagle's wings again. This version was a base for projects by Baron Koehne who was commissioned to put all the Russian heraldic practice in order. In l856 the arms prepared by him were authorised, namely the great, middle and small state arms, the great and small personal achievements for all members of the dynasty, the heraldic designs for state seals and for seal boxes as well as for the seals of the state authorities, central and local(30). The small state arms contained the eagle with shields on its wings but in the great and middle state arms Koehne preserved another composition, an eagle surrounded by escutcheons; namely the eagle was placed in the helmed shield held by supporters and adorned with a Wappenzelt, the whole composition being surrounded by nine freely soaring escutcheons. Unfortunately, this conception was not "incarnated" successfully: Koehne's heraldic knowledge and taste were wide but not deep. For example, Koehne recognized inescutchcons as charges and added to the Muscovite shield a narrow bordure Or trying to divide the field Gules and the eagle Sable. The same was done in the arms of the Taurian tsardom; the inescutcheon in the arms of Holstein remained "incurable", and finally Koehne tried to abolish it completely!(31). The scholastic understanding of heraldic rules forced Koehne also to turn the Muscovite horseman to the dexter. The small coats of arms of some Grand Dukes were differenced by bordures which disappeared in their great arms and the arms of an elder son of an heir was differenced by a coronet gorging the eagle in the shield, this being not a mark of cadency but a change of charges. The precedence of the provincial arms was out of order, this was probably the most ill-conceived part of the arms composed by Koehne. The traditional irregularity of details of provincial arms produced some new versions. Koehne's reform was not popular in Russia. In 1882 and 1883 the state arms were reformed once more(32) but the projects were made by the same author, the arms being changed a little but not corrected. In the great and middle versions a wreath of oak and laurel was included, established before for the design of seal boxes. It was a prototype for the numerous wreathes of the Soviet quasi-heraldry. The second crisis was an epiphenomenon of the Russian revolutions. The monarchy being destroyed, the Provisional Government abolished the old state coat of arms without establishing a new one. A State eagle authorized at that time was an uncrowned version of an emblem of the 16th century; on the government's seal there was a representation of the Parliamentary Residence below the eagle, this being an imitation of the sphragistical compositions of preheraldic times. The designer of the seal I. Bilibin was a specialist in such historical imitations. The eagle's use in colours (usually a black eagle without any fixed background) was no more than of a semi-official character(33). Almost all the double-headed eagles and other emblems used by the rest of the non-communist governments during the Civil War were also unheraldic and finally the Bolshevik regime tried to establish its own quasi-heraldic system based on the complete absence of an heraldic culture. Now, this second heraldic crisis being continued in Russia it is especially important to see it is unnecessary and even impossible to understand the history of the Russian eagle as a solid and consistent symbolic entity. The contact of heraldry and preheraldry produced a lot of singular synthetic emblems and arms, sometimes beautiful, but it did not produce a total synthetic emblematic system or genre. The mutual incompatability of the armorial and non-armorial traditions determined the inner dynamics of the Russian practice of public and private emblems, heraldry remaining nothing but heraldry. 1. Some authors analysed Russian heraldry more heraldically. In the early 20th century Y. Arsenyev, V. Lukomskiy, S. Troynitskiy, P. von Winkler and others were interested in the specific character of heraldry as a science, an art and sometimes as a play. This atmosphere was destroyed by the revolutions. 2. Likhachev N.P., "K istorii rossiyskogo gosudarstvennogo gerba" in Birzhevye vedomosti, 1915, N 14843, etc. 3. Alef G., "The Adoption of the Muscovite Two-headed Eagle: a discordant View" in Speculum, 1966, vol. 41, N.I. 4. The identification of the horseman was discussed for a long time. See: Koehne B. von, "Das kaiserlich russische Reichs-Wappen" in Vierteljahrschrift fur Heraldik, Sphragistik und Genealogie, Berlin, 1882; Kamentseva E., "Istoriya i simvolika gerba Moskvy" in Vestnik geraldista, 1990, N.I. ; Soboleva N.A., "O metodike izucheniya..." in Vspomogatel'nye istoricheskiye distsipliny, Vol. 8, Moscow, 1976; Vilinbakhov G.V., "Vsadnik russkogo gerba" in Trudy Gosudarstvennogo Ermetazha, Vol. 21, Leningrad, 1981. 5. The seal was made in the 1570s. See Stokl G., "Testament und Siegel Ivans IV" in Abhandlungen der Rheinisch-Westfalischen Akademie der Wissenschaften, Opladen, 1972, Bd. 48. 6. Snimki drevnikh russkikh pechatey (SDRP), Vol. I, Moscow, 1882, pl. 53, 54. 7. Polnoye sobraniye zakonov Rossiyskoy imperii (PSZ), I, vol. I, N 421. 8. Soboleva N.A., "Simvoly russkoy gosudarstvennosti" in Voprosy istorii, 1979, N6, p.47. 9. SDRP, pl. 51, 55. 11. Semenovich N.N., "Tri russkikh znameni..." in Soobshcheniya Gosudarstvennogo Ermitazha, Vol. 39, Leningrad, 1974; Milanov V.Y., Semenovich N.N., "Iskonno russkiye tsveta." in Leningradskaya panorama, 1989, N 8. 12. Russkoye iskusstvo barokko, Moscow, 1986, pl. I. 13. Obshchiy Gerbovnik.., Vol. 8, N 3. 14. Uzdennikov V.V., Monety Rossii, Moscow, 1986, p.147. 15. The collection of the State Museum of History (Moscow). Without the collar of St. Andrew reproduced in Lakier A.B., Russkaya geraldika, St Petersburg, 1855 (2nd edition: Moscow, 1990), pl. 18. 16. Vilinbakhov G.V., "Osnovanie Peterburga..." in Trudy po znakovym sistemam XVlll, Tartu, 1984; Medvedev M.Y., "Chto on sdelal s nashim gerbom" in Moscovia, vol. I (in printing). 17. Lakier A.U., op. cit., 2nd ed., p. 159; but: p. 142. 19. The old interpretation of the horseman remained popular. In the second half of the 18th century St. Xenia of St. Petersburg called him "a tsar on horseback". 20. Allard C., Novoye galanskoye korabelnoye stroyeniye..., Moscow, 1709, N 76 (the book was revised by the Tsar himself); Belavenets P.I., "Izmeneniye Rossiyskogo gosudarstvennogo gerba..." in Vestnik obshchestva revniteley istorii, Petrograd, 1915, vol. 2. 21. The Central State Archive of ancient acts (Moscow), F. 286, op. I, d. 61, fol. 110. Or, an IMPERIAL eagle Sable, its wings elevated or spread, beaked, legged, with claws and crowned with two crowns all Or, holding in its dexter talon a sceptre and in the sinister an IMPERIAL globe or orb Or. The crown ensigning the shield and the escutcheon of Moscow surrounded with the collar of St. Andrew are also described. 22. PSZ-I, vol. VII, N 4850. 23. Lakier A.B., op.cit., p. 184. 24. About the exercises of Volkov, see Winkler P.P. von, Gerby gorodov..., St. Petersburg, 1900; reprint Moscow, 1990. 25. PSZ-I, vol. XXV, N 19074, 19089. 26. The Central State Historical Archive (CSHA, St. Petersburg), F. 1411, op. I, d. 8. The colourful edition, with my introductory paper, is now prepared. 27. PSZ-I, vol. XXVI, N 19850. 28. About the development of these arms before matriculation see Troynitskiy S.N., "Gerby potomstva Glandy Kambily" in Gerboved, 1913, N.I. 29. Uzdennikov V.V., op. cit., p. 429. 30. PSZ-II, vol. XXXIII, N 31720. 31. CSHA, F. 1343, op. 15, group II, d. 98; see also F. 1493. 32. PSZ-III, vol. II, N 1035, 1159; vol. III, N 1402. 33. CSHA, F. 1411, op. I, d. III, et passim; see also Durov V.A., Russian and Soviet Military Awards, Moscow, 1989, pp. 42, 43.